A large multi-lane roundabout is planned to be built by WV Division of Highways (DOH) this year adjacent to the impending Eastwood Elementary site at the intersection of WV 705 and US 119/Mileground Road. In fact, the new school site would lose land (2 acres) to the state by eminent domain, to create the intersection relocation and expansion. This sprawling roundabout with its divided highway spokes would cover an additional 2 acres, approximately, that border and entangle the Eastwood schoolgrounds. Multi-lane roundabouts allow speeds of entry of 25-30 mph or higher: double the state mandated school zone speed limit. What would DOT Secretary Maddox do? 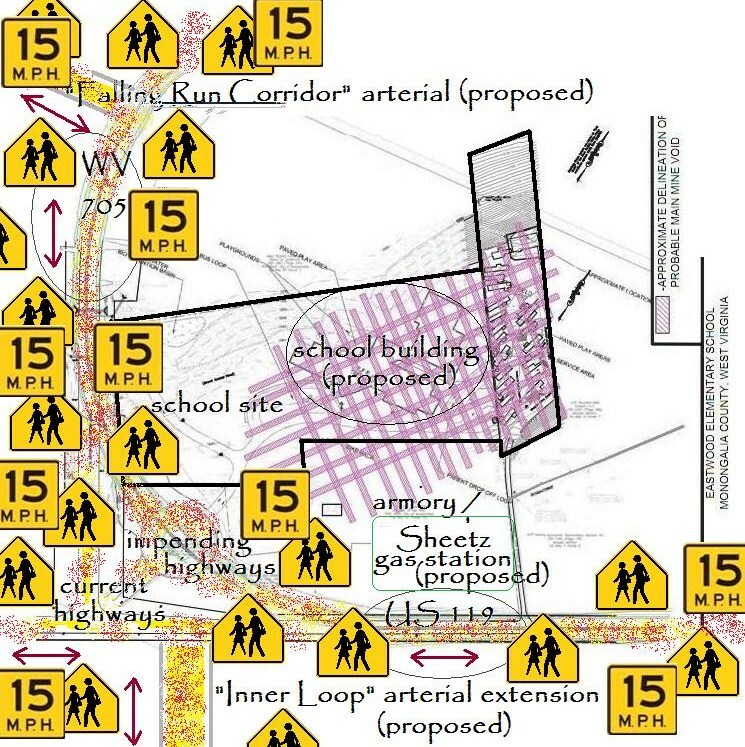 Would he raise the speed limit above 15 mph and thereby increasingly open the DOT to millions more in liability claims for potential injury or worse to the youngest of the schoolchildren, pre-kindergarten to fifth grade? Or would he leave the speed limit at 15 mph and inconvenience the flood of rush hours traffic that would exist by the school grounds throughout school opening and closing hours, as well as at recess hours? This is the uncomfortable decision that Superintendent Frank Devono and the Monongalia County school board and the WV School Building Authority and the State Board (and Department) of Education and the State Attorney General’s office are forcing onto the Secretary of Transportation. This is the negligent and dangerous situation that county Superintendent Devono and Monongalia County Board of Education are imposing on the residents and commuters and children of the area and region. By state Rule, a new school is not allowed to be located next to arterial highways, but since Director Mark Manchin of the WV School Building Authority and other state officials are determined to allow Mon Schools to break that state Rule, should Mon Schools also be allowed to break the state law of school zone speed limits? Of course not. Instead, given the dangerous intersection and multi-lane highways, the school speed zone law should be intensively enforced. Secretary Maddox should not raise the school zone speed limit, if the intersection school is allowed to open and operate. In that terrible case, the DOH and the DOT should strictly enforce a 15 mph speed limit there on the Mileground and on WV 705. The roundabout intersection pictured (and activated with Flash) above and below is somewhat similar to the roundabout to be installed as the 705/119 intersection in having two four-lane spokes and two two-lane spokes. However, the 705/119 roundabout intersection may have additional lanes, and is now slated to have five lanes extending at least from the spoke going across the Mileground (US 119). Further, the 705/119 roundabout and highways will have much more traffic on them than pictured below, especially during the SIX hours of rush hours each and every school day: morning, noon, and afternoon. Three-year-old girl killed crossing street by Hansen Elementary School.